Tire manufacturing giant, Michelin has recently unveiled an impressive new tire that’s unlike anything currently on the road. The Vision tire is structured in a unique way that renders it virtually blowout-proof and incapable of going flat, and it’s made possible through 3D printing technology. Unlike a conventional tire, the rubber of the Vision tire is structured with numerous cavities, or air pockets, which mimic the alveoli of lung tissue. The Vision tire is also made to be more flexible at the outer surface and solid in the center. The core of the Vision resembles a conventional wheel and is meant to serve the same function, as it can be reused even as new tread is reapplied or “recharged” when the tire wears down or needs to be modified for varied road conditions. 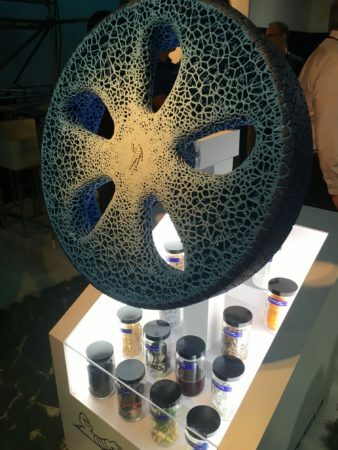 In an effort to make their tires more sustainable, Michelin is working on a way to make the wheel, and the surrounding materials from bio-sourced substances like butadiene—a synthetic rubber that could be sourced from straw, bamboo, paper and wood chips. Michelin is also looking at ways to incorporate sensors that would monitor the condition of the tires and provide the status for the driver in real time. Although Michelin has said the concept could be viable in 10-15 years, the company hasn’t provided a timeline for production plans or launch of products based on the concept. While it may be a time before the Vision will be an option for motor manufacturers and drivers, the technology to create them is said to be well within reach, according to Michelin Vision Project designer, Mostapha El-Oulhani. “We wanted the Vision to be realistic since no purpose is served by designing objects or services that we know pertinently are unrealistic,” El-Oulhani said. What are your thoughts on this unique tire concept from Michelin? Comment and let us know.